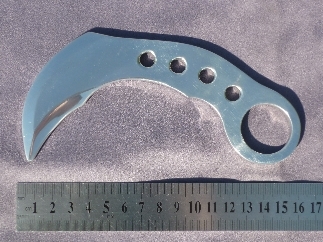 Manufactured in The Philippines for Eskrimador Supplies, the latest development in martial arts training knives is this very popular aluminium training dagger. Our daggers are made from high grade 6068 Aerospace Grade Aluminium which gives you the very best in performance. Its light-weight design and GSA 550 Military grade para cord handle gives it that 21st century look. This training dagger has become most popular amongst top Jeet Kune Do / Kali Instructors as well as practitioners and Masters of the traditional Filipino arts. 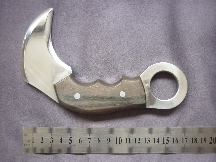 1 x Polished Aluminium JKD/KALI Training Dagger with black handle. Weight 55gr. 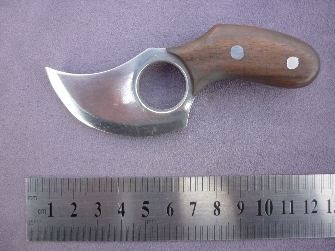 Length 16 cms. Supplied without cord handle. Manufactured to our design in The Philippines. Overall length approx 17 cms. 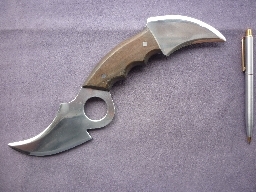 As above but with double ended blade. 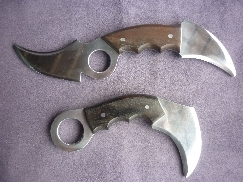 1 x Kerambit and Keramdulo offer.